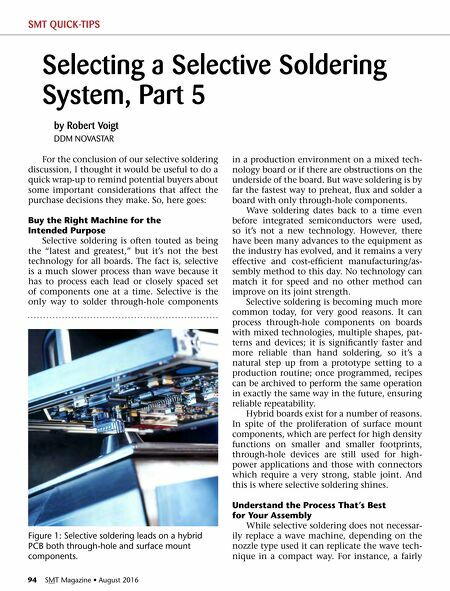 94 SMT Magazine • August 2016 For the conclusion of our selective soldering discussion, I thought it would be useful to do a quick wrap-up to remind potential buyers about some important considerations that affect the purchase decisions they make. So, here goes: Buy the Right Machine for the Intended Purpose Selective soldering is often touted as being the "latest and greatest," but it's not the best technology for all boards. The fact is, selective is a much slower process than wave because it has to process each lead or closely spaced set of components one at a time. Selective is the only way to solder through-hole components in a production environment on a mixed tech- nology board or if there are obstructions on the underside of the board. But wave soldering is by far the fastest way to preheat, flux and solder a board with only through-hole components. Wave soldering dates back to a time even before integrated semiconductors were used, so it's not a new technology. However, there have been many advances to the equipment as the industry has evolved, and it remains a very effective and cost-efficient manufacturing/as- sembly method to this day. No technology can match it for speed and no other method can improve on its joint strength. 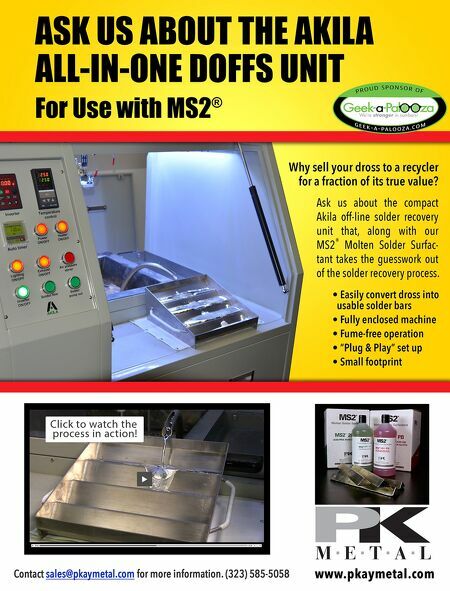 Selective soldering is becoming much more common today, for very good reasons. It can process through-hole components on boards with mixed technologies, multiple shapes, pat- terns and devices; it is significantly faster and more reliable than hand soldering, so it's a natural step up from a prototype setting to a production routine; once programmed, recipes can be archived to perform the same operation in exactly the same way in the future, ensuring reliable repeatability. Hybrid boards exist for a number of reasons. In spite of the proliferation of surface mount components, which are perfect for high density functions on smaller and smaller footprints, through-hole devices are still used for high- power applications and those with connectors which require a very strong, stable joint. And this is where selective soldering shines. Understand the Process That's Best for Your Assembly While selective soldering does not necessar- ily replace a wave machine, depending on the nozzle type used it can replicate the wave tech- nique in a compact way. For instance, a fairly by Robert Voigt DDM NOVASTAR Selecting a Selective Soldering System, Part 5 SMT QUICK-TIPS Figure 1: Selective soldering leads on a hybrid PCB both through-hole and surface mount components.